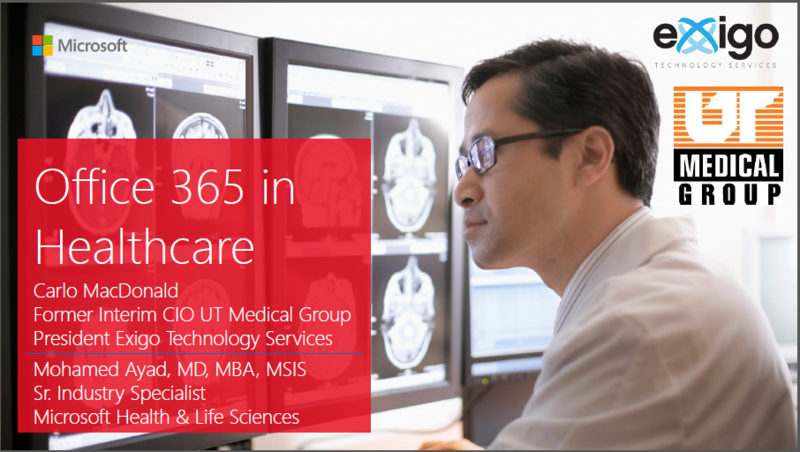 Exigo customer UT Medical Group needed to transition to modern IT in 2013. With Exigo principle Carlo MacDonald stepping in as interim CIO, the Exigo team began the process by migrating the on premise exchange environment to Office 365 and worked with Microsoft to ensure required HIPAA security was implemented. Microsoft had just added key HIPAA compliant processes to Office 365 that today enables the healthcare industry to use the Microsoft cloud with assurance that patient data is protected. Exigo was asked by Microsoft to speak at the #1 healthcare IT conference HIMSS on the topic of moving your medical practice to the cloud and modernizing your practice. You can view the presentation at the following link.